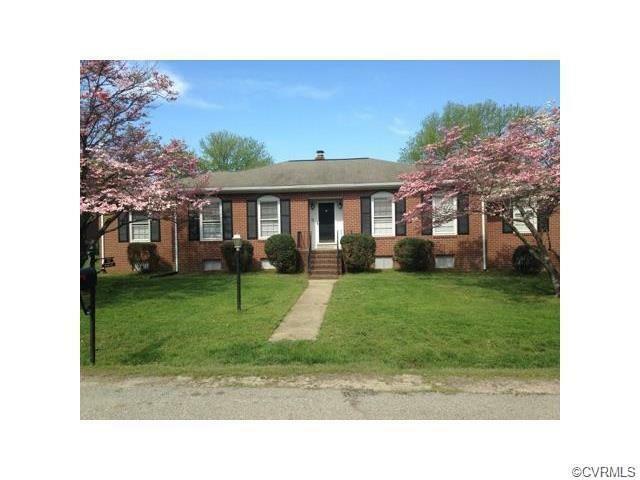 Beautiful all brick rancher! This custom built home features 4 large bedrooms with lots of closet space, 3 full baths, formal living & dining rooms with gas log fireplace. Beautiful refinished hardwood floors on main level. Eat-in-kitchen with breakfast nook and stainless steel appliances to include range, double ovens, dishwasher and refrigerator. NEW roof, NEW kitchen floor, NEW floors in all 3 bathrooms. Full basement, half is beautiful family room and rec room featuring gas log fireplace and new carpet. The other half includes full bath, storage and large work area. 5 ton heat pump is approximately 3 years old with a transferable warranty. Whole house generator, kitchen appliances convey. Covered back porch, whole house generator and 2 large sheds and so much more. Home is sold in As-Is Condition with no known defects. Washer and dryer DO NOT convey. Don't miss this fantastic home! Directions: Cedar Level Road To Pocahontas, Turn Left On Bland Ave - Look For Sign.